According to the Documentary History of the Church (DHC) 2:235, it was on July 3, 1835 when Michael Chandler “came to Kirtland (OH) to exhibit some Egyptian mummies.” According to the record, “There were four human figures, together with some two or more rolls of papyrus covered with hieroglyphic figures and devices.” Chandler’s display so intrigued the Mormons living in Kirtland that they told the traveling showman how their prophet, Joseph Smith, had the ability to translate the papyri. How Chandler could make such a statement is a mystery since he was not an expert in this field. The fact is, there was nobody in the United States who at this time could claim to have expertise in the translation of Egyptian hieroglyphics. The Rosetta Stone, which was instrumental in allowing scholars to decipher the hieroglyphics, had only been recently found (1799) and whatever few “experts” there were in the Egyptian language resided in Europe. In a way, Smith’s bravado demonstrates his gift as a confidence man. Without any Egyptian linguists, he knew how difficult it would be to prove any of his so-called translations untrue. Since he had gotten away with this ploy for five years by claiming that the Book of Mormon was written in “Reformed Egyptian,” why shouldn’t this ruse work again? Smith seemed to use the limited expertise of his time to full advantage. Imagine for a moment what a find this would be if, in fact, Smith had really discovered the writings of Abraham and Joseph. They would be priceless for they would be the oldest manuscripts available written by someone mentioned in the Bible. In fact, they would be the only autograph manuscripts available. To say the papyri obtained by Smith were written by both Abraham and Joseph would predate the Christian era by about 2,000 years! For a sum of $2400, Smith’s followers were able to convince Chandler to part with his exhibit, thus enabling their beloved prophet to continue “translating” the text. Smith would continue with this project, but he would not be able to finish it. Eventually he would be killed by a mob while incarcerated at a jail located in Carthage, Illinois. After his death the papyri would be lost. Many believed it was destroyed in the great Chicago fire, never to be recovered. In time more and more men would become familiar with the Egyptian language. In 1912 Smith’s translation would be called into serious question by an Episcopalian Bishop named F.S. Spaulding. Spaulding published a 31-page booklet entitled “Joseph Smith, Jun., As a Translator.” In it he included the findings of eight scholars who had examined the “facsimiles” or drawings which are found in the Book of Abraham. All concluded that Smith’s translation was erroneous. The Mormons responded by soliciting the services of a man named J.C. Homans who wrote under the assumed name of “Dr. Robert C. Webb, Ph.D.” Homans was neither an Egyptologist nor did he hold a doctorate degree. Although his arguments failed to convince the learned, they were enough to appease the faithful Latter-day Saint, so “testimony” once again reigned over fact. In 1967 interest in the Book of Abraham again surfaced when the papyri Smith used in 1835 were found in the Metropolitan Museum of Art in New York. They were eventually given back to the LDS Church. One would think that, if Joseph Smith were indeed a prophet who was inspired by God to translate the Book of Abraham, this would have been the perfect opportunity to have proved it. However, this was not to be the case. Experts once again proved Smith’s translation was incorrect. Not only was Smith’s translation erroneous, but he completely missed the time period in which the papyri were written. Smith claimed his papyri were written by Abraham around 4,000 years ago; however, experts agree that the papyri go back only as far as the time of Christ. Whereas Smith claimed his papyri told the story of Abraham’s adventures in Egypt, the experts concur that what Smith had in his possession was nothing more than a portion of a funerary text known as the Book of Breathings, a condensed version of the Book of Dead. Below the “altar” are figures which Smith said represented the idolatrous gods of Elkenah, Libnah, Mahmackrah, and Korash. 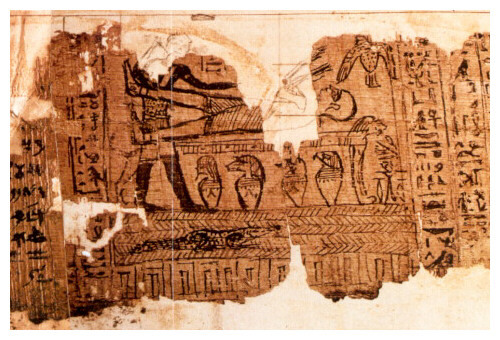 Below these figures is the drawing of a crocodile; Smith labels this “The idolatrous god of Pharaoh.” As previously mentioned, this facsimile depicts nothing more than a portion of Egyptian mythology. Dr. Robert K. Ritter, associate professor of Egyptology at the University of Chicago stated, “I want to be absolutely clear on this. There simply is no justification for the kind of interpretations that appear in facsimile one or facsimile three. They are wrong with regard to the hieroglyphs, they are wrong with regard to the gender, they are wrong with regard to the understanding of what the scene actually represents and where they are used in the body of the text. They are wrong there as well. In short there is no historical validity for the interpretations in that book. None whatsoever.” (The Lost Book of Abraham DVD). Despite the fact that Smith’s “translation” has been found to be incorrect in every detail, the LDS Church stubbornly continues to include his pretended “Book of Abraham” as part of its scripture. However, the evidence has forced the LDS Church to revise its explanation as to how Smith arrived at this conclusions. In 2013 the LDS Church announced a new edition of its scriptures. Under the heading “Introductory Note,” previous editions of the Pearl of Great Price said the Book of Abraham is “a translation from the Egyptian papyri,” thus giving the impression that Smith rendered the Egyptian text into English using a generally understood method. However, the 2013 edition of the Pearl of Great Price now states that the Book of Abraham is “an inspired translation.” It is obvious that this change was necessary since a generally understood method of translation from the Egyptian would not at all allow for the explanations given by Smith. In order for the dead to achieve a glorious afterlife, the ancient Egyptians believed the heart of the deceased would be placed on a scale and weighed. Thoth, the scribe of the gods, noted the good and bad which the heart contained. If the heart balanced perfectly against a feather taken from the headdress of the goddess Maat, the deceased was entitled to eternal life. To help them reach the eternal paradise, Egyptian priests put together what is known as The Book of Dead which was placed in the tomb of the deceased. Rev. Prof. C.A.B. Mercer, Ph.D., Western Theological Seminary, Custodian Hibbard Collection, Egyptian Reproductions.